Our mission is to support the Wamego Health Center in achieving excellence in medical services by funding upgrades to facilities and equipment, as well as programs that promote wellness and access to superb, local healthcare. The Wamego Hospital Foundation is a non-profit 501(c) 3 organization which procures philanthropic support. If you or a loved one received exceptional care from a Ascension Via Christi Hospital in Manhattan physician, nurse, therapist or other employee, say “thank you” with a gift in the caregiver’s honor to the Guardian Angel Program. Along with your generous gift, tell us about the special care you or your loved one received. We’ll share your kind words with your “angel” and recognize him or her with a letter of acknowledgment and this custom-crafted Guardian Angel lapel pin. Print and fill out this form and return it to Tina Rockhold, Executive Director. Together we impact more lives. Wamego Hospital Foundation is a partnering with the Wamego Community Foundation on the inaugural Wamego Match Day, Friday, June 7, 2019. On that day, the Wamego Community Foundation will match donations made by our citizens to the Wamego Hospital Foundation fund at .50 cents per $1. That means your donation of up to $1,000 to the charity of your choice goes 50 percent farther to meeting the needs of those the organization serves. Come to the event on June 7, 2019 and donate. Visit Iron Clad, 427 Lincoln Ave., Wamego, between 7 a.m. and 7 p.m. Gifts can be made by cash, check or online using a credit card. When donating by check, one check must be made payable for all donations to the Wamego Community Foundation. Donors will designate the fund distribution on a separate form. Cash and check gifts should be made in person at the event. Credit cards are also accepted at the event. Online Match Day gifts made between 12 a.m. and 11:59 p.m. on June 7 will also qualify for matching amounts. Visit wamegomatchday.com. Individual contributions to charitable funds ranging from $25 to $1,000 will receive a local match at $.50 per $1, so a $1,000 gift will receive a $500 local match. If a donor gives a $5,000 gift split evenly between five organizations, each group would be eligible to receive an additional $500 in matching funds. Gifts made in person at Iron Clad will qualify for prize money incentives for Wamego Hospital Foundation. On behalf of the Wamego Hospital Foundation Board, I invite you to join in this day of philanthropic support for the growth and betterment of our community. Until then, please feel free to contact me at 785-458-7380 with any questions or suggestions. I look forward to our conversation! 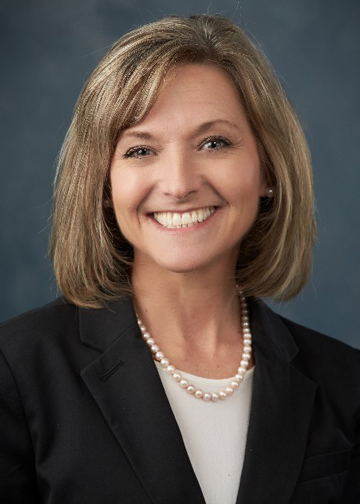 Tina joined the Wamego Hospital Foundation as Senior Development Director in December 2018. She brings over nine years of extensive foundation experience and is passionate about cultivating philanthropic support for healthcare, especially in rural communities where access to medical services is shrinking. In her role, Tina will provide leadership for fundraising strategy including annual and planned giving, capital campaigns, donor relations, special events, grant proposals, and numerous other fundraising opportunities. Tina earned a bachelors of arts degree in journalism and public relations from Texas State University and a masters of arts in education administration from University of Missouri – Kansas City. She has worked in hospital administration since 2004. Beyond her work with the Foundation, she thrives in helping others through volunteering, enjoys spending time with her three grown kids, and taking in the natural beauty of the Flint Hills.